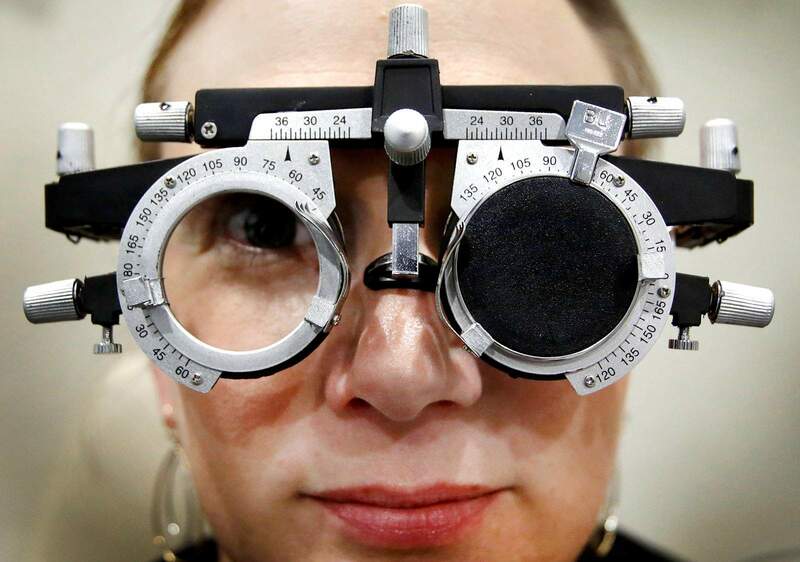 Karen Talley, a registered nurse with Southwest Retina, demonstrates an eye test. Patients participating in clinical trials will have their vision tested with these trial frames. 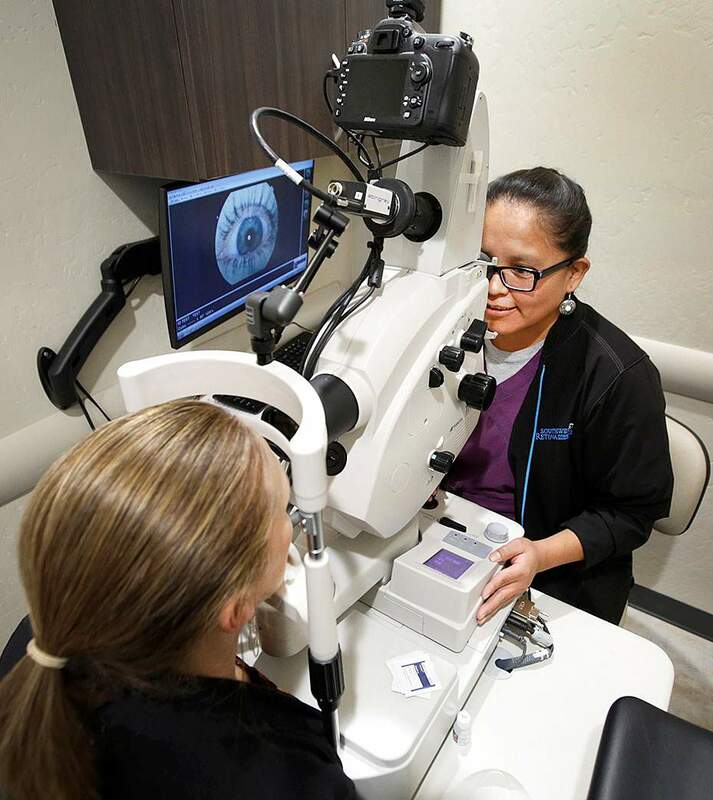 A new research center focused on ocular conditions in Durango will offer hope to patients suffering from otherwise incurable disorders. Southwest Retina Consultants added 800 square feet to its clinic in the Horse Gulch Health Campus on East Eighth Avenue for its new Southwest Retina Research Center. The first research trial will start at the end of the month, said Dr. Moss Fenberg, an owner of the clinic. Fenberg opened Southwest Retina in 2014 to provide medical and surgical care for all ages, serving primarily older patients. The new research center will give patients from across the region access to medications and devices that would otherwise be unavailable, said Dr. Sara Haug, a clinic owner. The clinic’s first four trials will focus on treating those with macular degeneration and conditions related to diabetes. No effective treatment for dry macular degeneration is available, and a trial focused on that condition is already drawing interested patients. “We have people calling every day interested,” Haug said. Normally, clinical trials take place in big cities, however companies that sponsor the trials, such as Genentech, are interested in Southwest Retina because it serves a large geographical area where there are no other clinics offering similar services, Fenberg said. Patients will drive four hours to the clinic for care from Utah, Arizona, New Mexico and Southwest Colorado. “This is a very productive site for them because they have no competition,” he said. Fenberg was the first retinal specialist to serve patients in Durango starting in 2011, and it has been part of his plan for a long time to offer clinical trials. Caroline Tom, right, with Southwest Retina demonstrates a camera that captures lesions caused by macular degeneration. It is primarily used to determine whether a patient has wet or dry macular degeneration. Southwest Retina remodeled storage space at the back of the clinic into three exam rooms and four administrative spaces for the research center in 2016, Fenberg said. That same year, Haug joined Southwest Retina and that allowed the clinic to pursue a research center. Research requires one doctor who knows what medication patients in a trial are receiving and one who does not. It took about 18 months for the clinic to open the research center because it had to prove to companies sponsoring trials that it was a reliable site with the proper staffing, equipment and space. The center hired two employees to coordinate trials, work with patients and monitor outcomes. 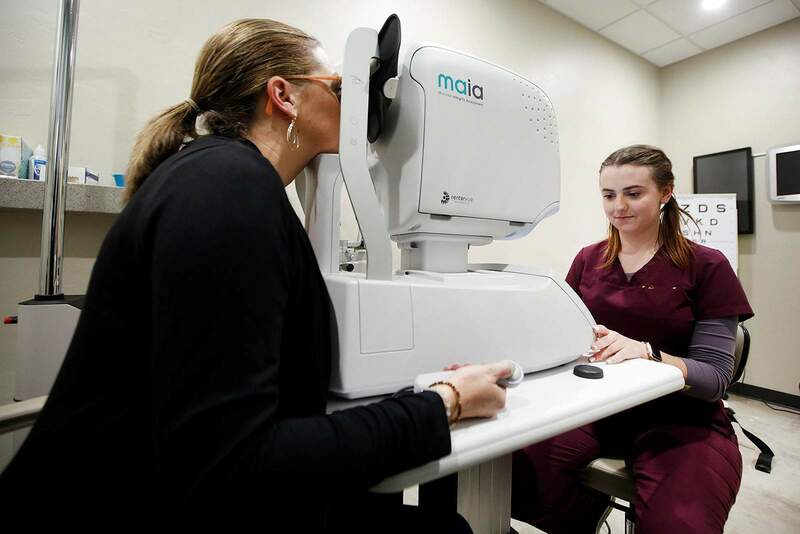 The center already serves many patients with macular degeneration and diabetes, and some of those patients, who have not seen success with current therapies, are enthusiastic about the opportunities to participate in the center’s trials. Patients with wet macular degeneration can be successfully treated with monthly injections that can preserve and sometimes improve vision. Wet macular degeneration is caused by leaking blood or fluid, and it can cause blurry vision, blind spots and distortion. “The world starts to look like a fun house mirror,” Fenberg said. Dorothy Newell said she has received regular injections for seven years. She is pleased the treatments have preserved her vision. “The injections aren’t pleasant, but the soreness only lasts a few hours,” she said. Mariah Fuller-Pazell, right, with Southwest Retina Consultants demonstrates the Maia, a microperimeter, on Karen Talley, a registered nurse, also with Southwest Retina, at the office at the Horse Gulch Health Campus. The machine is used in research to track the atrophy of the retina that happens during macular degeneration. Before 2005, there was no effective treatment available for wet macular degeneration, which leads to blindness, Fenberg said. The injections were developed using a drug originally intended to keep cancer cells from metastasizing, he said. Additional research into treatments for wet macular degeneration could focus on alternatives to regular injections. For example, clinical trials investigating inserting a tiny semi-permeable reservoir filled with medication into an eye that would slowly release the drug, Fenberg said. Patients with dry macular degeneration, a condition that also leads to blurry vision and blind spots, do not have any treatment options outside of clinical trials. It is a condition caused by a thinning of the macula, the central part of the retina, Fenberg said. Future trials at the clinic might explore treatments for inherited retinal disease, inflammatory eye disease and retinal vascular occlusion. Retinal vascular occlusion happens when blood supply in the eye is blocked, which can cause the retina to swell, he said. Clinical trial participants receive treatment for free, and they are reimbursed for their travel. There is no guarantee a patient is going to receive treatment if they participate. They could be selected to receive a placebo, which is part of proving a drug works, Fenberg said. Even if a patient receives a medication or a device that is being tested, there is no guarantee their vision will improve. Patients also have the option to withdraw from trials if they choose. The center expects to have a dozen to several dozen patients participating in any given study and hundreds of patients to participate in its clinical trials over time, he said. Trials can take several years to complete and take place at many sites. For example, one of the trials Southwest Retina is participating in will take place at about 100 international sites, Fenberg said. The clinic plans to participate in trials that are in later stages focused on testing the efficacy of medications or devices that have been proven to be safe, Haug said. The clinic cannot advertise its clinical trials, and the doctors plan to recruit participants from among their own patients and other clinics in the area, she said.